As urban gardening continues to trend, container gardens are popping up everywhere! Container gardens are perfect small-space solutions. Not only do they provide added appeal to your space, they also give you delicious food right at your fingertips. If you have limited space, or simply just want to add another element to your existing crop, grow these container plants on your patio this summer. Blueberries – These sweet summer fruits grow great in containers. Because blueberries are so small, you can get a big harvest with very little space. Blueberries love acidic soil, so check the pH level of your soil and add Espoma’s Holly-tone if necessary. Check out more on growing blueberries here. Tomatoes – With tons of varieties, there is a tomato for everyone. Some of our favorites to grow in containers include smaller varieties like grape or cherry tomatoes. These are easy to pick right off the vine and are perfect for gardening with kids. Learn more about growing tomatoes in our ultimate tomato-growing guide. Peppers – Like tomatoes, peppers come in many different shapes and sizes. Whether you’re looking to add some spice to your garden with jalapenos, or prefer milder bell peppers, these colorful veggies are a vibrant summer sight. Peppers love lots of direct sun, so plant these containers in a bright area. Zucchini – One of our favorite summer veggies, zucchini are a bit larger than tomatoes and peppers and need more room. Grow in a container with at least a five gallon capacity with proper drainage. Use Espoma’s Garden-tone to get the most out of your zucchini plants. Like peppers, zucchini will thrive with 6-8 hours of sunlight, so plant in a sunny spot. Herbs – Because herbs are small, they are the perfect fit for any container garden. Kitchen staples such as rosemary, basil and mint are great additions to any dish, or even a refreshing summer drink. Grow herbs in Espoma’s Organic Potting Mix in containers inside or out. If you have limited space, don’t let that discourage you! With the right containers and a little bit of planning, you can have a delicious summer harvest in no time. Check out this video on container plants and tell us what plants you’ll be growing in containers this season in the comments. Sun-kissed, slightly tart blueberries. Sweet, juicy raspberries. Scrumptious strawberries as sweet as candy. Sugary, tart blackberries. Who can resist such delightful, fresh flavors right from the garden? Certainly not local birds! Crows, blackbirds, robins, jays and more swoop in and eat your berries right from under you! If you’re growing blueberries (or any berries! ), you want to make sure you get to enjoy them, not the birds. Here are our tips for protecting your berries from those hungry birds — while still being kind. If you’re growing blueberries, make sure you get to enjoy them, not this sparrow. Here are our tips for protecting your berries from those hungry birds — while still being kind. 1. Location, Location, Location. Plant or move berries away from hedges and larger shrubs since birds like to rest there. 2. Take Cover! When your berries are immature, add a row cover or bird netting. Make sure the netting is secure, so the birds can’t undo it. This is, hands down, the best way to protect berries. 3. A Sprinkle of Sparkle. Tie a shiny bird scare tape, or foil tape, around your berry bushes or plants to deter birds. Birds don’t like the movement or the tape’s bright reflection. 4. A Dash of Pepper. Sprinkle cayenne pepper around your berry plants as they begin to ripen. This method is super easy, but makes it hard to enjoy eating berries as you pick! You have to wash off the berries before eating to remove any remaining pepper. 5. Snack Attack! Install a few bird feeders to encourage birds to eat there — and not your berry bushes! Victory! Now, make sure your blueberries continue to thrive by feeding with Holly-tone. Keep the soil acidic, too, with Espoma’s Organic Soil Acidifier. Learn more about growing organic blueberries in our berry guide. You’ll be a pro in no time! Grow blueberries in your garden, on your patio or balcony in containers. They don’t take much space or effort. And, once you know the basics, you are good to grow. Native to North America, blueberries grow well in acidic soil and in areas with at least 140 frost-free days per year. They’re also perfect for organic gardeners since they can easily be grown without pesticides. Below are our favorite picks for beginners to grow. Photo courtesy of USDA-NRCS PLANTS Database / Britton, N.L., and A. Brown. Jersey Blueberry – One of the classics in the blueberry world. This reliable plant is super easy to grow and produces pounds and pounds of blueberries. Emerald Blueberry – These berries are so enchanted you’ll think they’re from the Emerald City of Oz. This new blueberry variety is one you can count on. Year after year, it produces some of the biggest blueberries you’ve ever seen. Pink Icing – With breathtaking spring and fall foliage and large, sweet berries mid-summer, this gem makes small spaces shine. Plus, these bushes are self-pollinating, so only one bush is needed to produce fruit. Looking for more options? Learn about the best tasting blueberries and the best blueberries for containers. Visit our Organic Berry Gardening Guide for even more tips and tricks. We all strive to live a healthy life and that trend is making its way into the garden. Homegrown organic food doesn’t just taste good, but also packs a nutritional punch. It’s safe to say you’ll be anything but blue when growing blueberries. Jams, muffins and smoothies are only a few steps away! And if those treats don’t inspire you, get this: When you eat antioxidant-packed blueberries, your brain gets a boost, your belly fat can be reduced and you may even prevent certain cancers. Blueberries are simply the best. So grow the best blueberry varieties you can! Answer a few quick questions below, and then skim our Blueberry Variety Guide to find the absolute best type for you. Growing blueberries is easy as long as you pick the right berry variety for your yard. Set yourself up for a berry successful season by answering these common berry FAQs. 1. What type of blueberry works best in your area? There’s a type that works best for each USDA Gardening zone. Find yours using our chart below. 2. What’s the pH of your soil? Grab a soil test and discover the pH of your soil. To thrive, blueberries need a soil pH between 4-5.5. Lower your soil’s pH with Espoma’s Soil Acidifier. This organic alternative is much safer than Aluminum Sulfate. Also, plan to use an organic fertilizer for acidic plants, such as Holly-tone. 3. How many chill hours are in your area? Blueberries need a certain amount of time in dormancy, these are called chill hours. See how many chill hours are in your area and select a blueberry that matches. 4. When do you want your blueberries to ripen? Early: Some blueberries ripen as early as May and are finished by the start of June. Late: Other varieties of berries only ripen in mid-August and produce fruit through September. 5. What’s your ideal blueberry taste and look like? Decide whether you want sweet or tart berries. Then select the plumpness. Do you want teeny-tiny or super-sized blueberries? With vibrant hues of blue and sweet flavor, no summer fruit is better known (or better for you) than the blueberry. These blue wonders play a vital role in health and well-being. 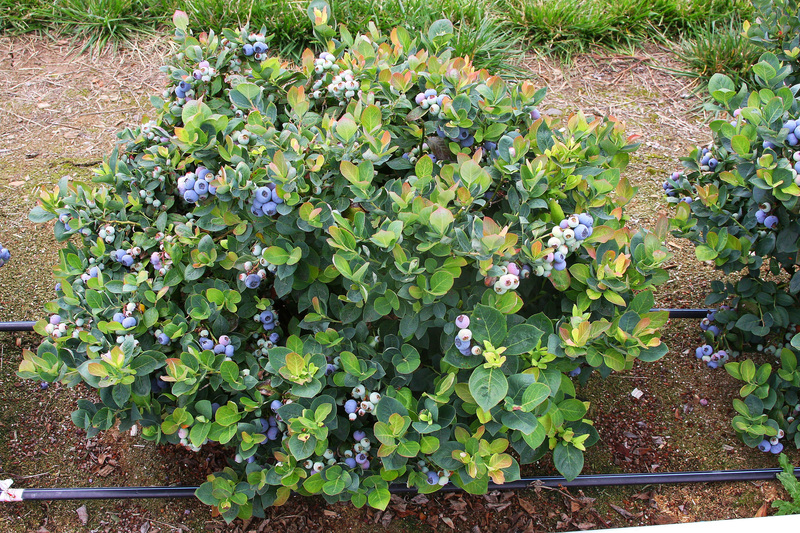 Plant a blueberry bush today and savor the fresh berries all summer. If flavor is your top priority, you absolutely must add these blueberries to your garden! Just imagine how mouthwatering that first, homegrown blueberry will be! Until then, though, you’ll keep busy! While growing blueberries, be sure to feed with Holly-tone and keep the soil pH low with Soil Acidifier. Photo courtesy of Richard Shiell for Monrovia. Southmoon Blueberry – A southern favorite that does well in hot temperatures, the Southmoon blueberry is a delicious pick. The sky-blue berries are a nice touch, too. Plant in lighter, sandy soils and ammend with lots of organic material. 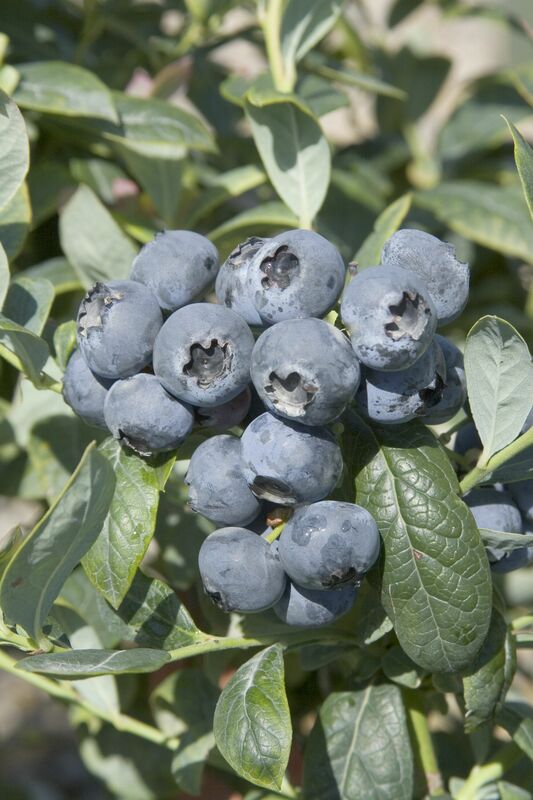 O’Neal Blueberry – The O’Neal produces dark blue berries that taste more like candy than fruit. With high-sugar content, you’ll want to eat these yummy berries right as soon as you pick them. 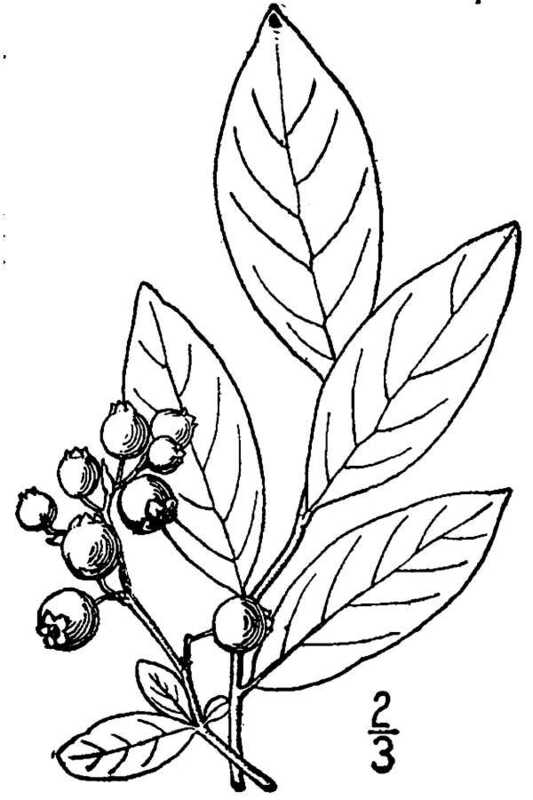 As a semi-upright shrub, you can let this blueberry grow wild and free or train it to grow up. Polaris Blueberry – If you love to eat blueberries early in the season, the Polaris is for you! The Polaris was developed in Minnesota, so you know it can handle the cold, too! Go ahead, and pair with Northblue to increase blueberry yield. Bushel and Berry™ Blueberry Glaze – These berries are small in stature and have incredibly glossy, dark green leaves reminiscent of boxwood, and can easily be sheared as such. Small, almost black berries present in little bundles mid-summer. With their deep flesh color, Blueberry Glaze packs a healthful punch with antioxidant-rich qualities. Looking for more options? To learn more about blueberries, the best blueberries for containers, how to plant, care for and grow, visit our Organic Blueberry Growing Guide.